When your potential clients click on your online advertisement, your landing page will provide them with their first interaction with your organization and your product. Therefore, you need to ensure that you get your first impressions right with a beautiful landing page. This article will expand on the brief introduction that we have already covered in our previous article. At the end we will ensure that you master the art behind a beautiful page that increase the chances of conversions. Here are five more tips on how to create a beautiful landing page. One of the biggest challenges when designing a landing page is finding the perfect balance between ensuring that you provide adequate information and while the landing page is clutter free. 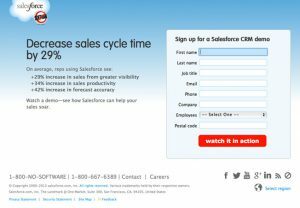 On one hand, you want the potential client to have as much information as possible about your product offering in order to convince them to respond to the call to action. Remember a lot of information on your page, is a distraction recipe. What is an effective way to find a balance between providing adequate information and maintaining a clutter free landing page? Include only the most vital information that would grab a visitor’s interest. Also ensure the information is prominently displayed on the page. 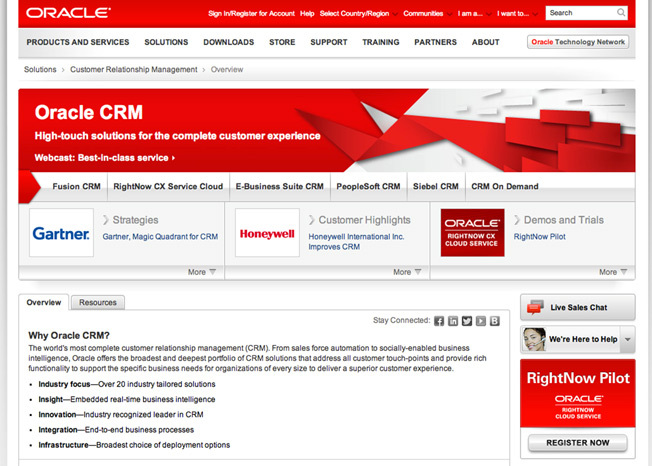 The image below, for Oracle’s CRM software is a perfect example of a cluttered page. There is simply too much information on display and too many links that compete for the visitor’s attention. 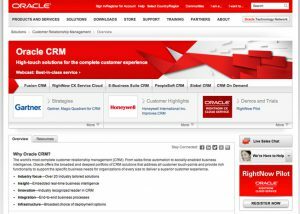 On the other hand, the page for a competing CRM package from Sales force (shown below) is less cluttered. It also provides the vital information needed by a visitor with the invitation to further learn more about the product. 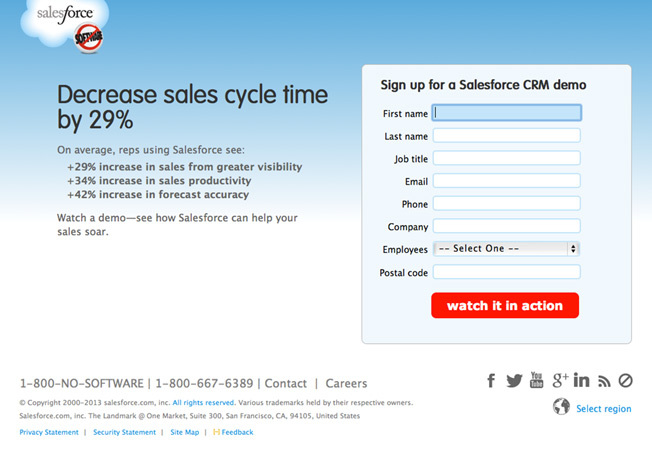 Another useful way of pacing a lot of information within a small space on the landing page is to use videos. If you have a lot of information that you need to impart to the interested visitor then a video is your way out. A single video will not take up a lot of space on the landing page. It can be packed with useful information to convince the visitors to respond to the call to action. The first step in the creation of any marketing campaign is understanding the market segment that you will target with your product or service. To create a beautiful page, they need to be custom and appeal your intended target audience. There is no standard unit of beauty, what appeals to young creatives is not what appeals to business executives. A design of the landing page needs to consider the target audience to ensure it directly appeals to their needs and preferences. Your landing page needs to have a logical flow of information. First introduce your product, explain what market needs it addresses. 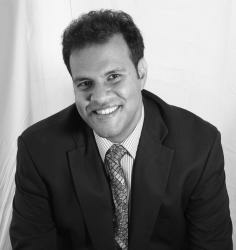 Explain the features and the specifics of the offer you are marketing. Your aim, as a marketer, is to persuade visitors to respond to the call to action; therefore, you need to logically communicate to them. If your page is confusing to the reader, then you will have very low conversion rates. With high usage of mobile devices and readily available internet, phones have become primary browsing devices. Therefore, you need to ensure that your page design (and by extension, the design of all your web pages) is mobile friendly. When determining the layout of your landing page including image placement and the location of links and navigational buttons, you need to ensure that the mobile browser experience on your landing page does not differ from the PC browsing experience.